Yamaha has an uncommonly long tradition in manufacturing musical instruments, dating back to 1862. With that kind of background, which few audio manufacturers can boast, one expects products a cut above the average from such a company. Mode AX 592 boasts a nominal power output of 100W per channel into 8 Ohm loads, and there are claims of substantial impulse power outputs into difficult loads. In fact, on the back you'll find a switch which sets the unit for easier (6 Ohms or greater) and more difficult (below 6 Ohms) loads. As a believer in the theory of an amplifier being a voltage source, and if possible not caring at all about what load it drives, I set the switch for difficult loads and forgot all about it. The front panel is uncommonly simple and uncluttered. On it, you'll find just what you might need on a daily basis - power on/off switch, speakers A and B (and A+B) switches, input selector, volume control and not one, but two bypass switches. However, looks can be deceiving - if you flip down the control panel, you'll find the other controls. From left to right, you have bass and treble pots, a subsonic filter, balance control, loudness pot and a Rec Out control. The loudness pot is and has been for decades now a Yamaha special. It is not a simple switch, with an on and off position, using predetermined values, but a potentiometer. It works like this - instead of simply accenting the bass and treble (typically +8/+3 dB at 1W), it in fact starts to decrease in volume the midrange, bass and treble, this producing two effects. On one hand, it acts as a variable muting, and on the other hand, it does provide a user controlled loudness contour curve. Very neat, and an intelligent solution, if you're into that kind of thing. I'm not, so I tried it and then forgot all about it. Though less than some, this is more than others, but on the whole, it's all right for a mainstream product. A notable point: the subsonic filter is not your usual cheap'n'cheerful affair, but a serious one, with a cutoff frequency of 18 Hz and a slope of 18 dB/oct, a real boon for turntable owners. Speaking of which, an MC/MM input is provided - a rarity these days, as is the headphones output on the front. Also on the back, you'll find the usual U-shaped pre-main couplers, input and output RCA connectors of reasonable quality, while the CD input jacks are gold plated. Speakers use binding posts, and pair A, presumably your main pair, uses really heavy duty binding posts - I had no problems with my Jamo OFC speaker cables, which are hardly small at 4,5 mm (2x256 strands). Inside, you'll find a very substantial power transformer, which accounts for much of the unit's 12.9 kg weight; it looks solid, it feels solid and it's as quiet as a doornail even at full power. Yamaha uses what it calls "thick wire technology", which is a fancy way of saying that their jumpers use really thick wire, not the usual thin-as-a-hair wiring. Despite the sheer number of components used, the inside is about as orderly as it can be for classic manufacturing methods, i.e. without using more advanced technology, like SMD. Note the two reasonably sized heat sinks. Speaking of the power amp section, it uses two pairs of transistors for its power delivery per channel - these are 2SA1694 (PNP) and 2SC4467 (NPN) transistors. They are described as 120V/8A/80W/20 MHz devices in catalogs - not exactly generous for the given power output, I'd say. Note the standard tolerance but metal film emittor resistors - another surprise. On the other hand, there is an unusually large number of high and very high quality capacitors inside, from Nichicon's Muse series (the two green cans on the picture to the left, but there are others elsewhere), to the main power amp capacitors, which in this case are Elna for Audio units, rated at 12,000uF/63V. Generally recognized as very good components, at a price, I must say I was very surprised to find them in this unit, in view of its price. Just to the left, you might notice the bridge rectifier, a very substantial 20A unit. While the power amplifier circuitry is all discrete, the preamplifier is a typical product of hybrid technology. It uses both discrete transistors and integrated circuits. So, the MC pre-preamp uses low noise transistors, and practically everything else generally uses ICs, including the switching, which uses typical SMOS switches. The preamp is a separate board, with additional boards for volume and selector, and another for tone controls. While the volume control and source selector are motorized, and hence may be activated from the supplied remote control, all components are of standard Japanese industrial (i.e. mass produced), which is to say lowish quality. Another nice touch is the provision of three convenience power outlets, all of the switched - this does make life more convenient, as their total rating is 100W, more than enough for a CD player, a tuner and a say cassette deck. Back to not one, but two bypass switches. The first, labelled "Pure Direct" bypasses everything except the input selector and volume control, and the other, labelled "CD Amp Direct" further bypasses the input selector as well, but works only for the CD player. However, it also reduces the overall overload headroom - I ran into problems with a CD palyer with an uncommonly high output, which instead of the standard 2V delivered 2,9V. While this didn't actually overload Yamaha's input, it did sound stressed. Deactivating the "CD Amp Direct" switch improved matters no end, but made the sound less desirable. This is true in general of this unit - activating the direct switch improved the sound very considerably, testimony to inadequate preamp design. Given its nominal power and price, I expected the Yamaha to require turning the volume up before it started sounding decent - fortunately, I was wrong. It sound almost exactly the same at low power and much higher up the scale, only louder. What it has it delivers at all and any power level on amore or less same basis, which is good news, since most of us (I believe) use relativly modest average power levels, in fact around 0,5-1,5W on average, and need the rest of the power for dynamic peaks (except those folks who happen to have speakers of low sensitivity). As is, the sound isn't anything to write home about - but activate the direct switch and things improve very considerably. You start hearing details which weren't there a second ago, and your mid and high ranges clear up rather considerably, the treble becoming more open and natural. It's not as sweet as tubes, it has no sheen, but it doesn't spit or scream at you either. I would say the treble is fairly precise and fairly well balanced in terms of acoustic quality, but is slightly recessed in comparison with the mid range. Approximately the same could be said of the bass. What there is is good in quality, well controlled, but lacks the weight and authority needed to drive the music along. It's not deficient in bass, it's just that the bass isn't what it should be, being on the light side of things. As note before, the quality of sound changes very little as the volume increases. Therefore, the same comments made for microdynamics apply here as well. As is to be expected from a 100 watter, the dynamic range is not just good, but is in fact one of the best I've heard. The reason is a simple one - when you select a high level input, like tuner, CD or tape, then crank the volume up all the way, go over to the speakers and put your ear right there next to the tweeter, you'll be surprised how little noise you'll hear. I can't remember when was the list time I hear such absence of noise even on much costlier and presigious units, let alone mass produced items (remember, still with the direct switch engaged). When using this test, remember to decrease the volume at once, or you may be in for a surprise later on. There is certainly no shortage of power here. The AX 592 negotiated each of my three pairs of speakers, including the more difficult AR94, with great ease and no sweat. I suspect that this was so partly because of its rather low quiescent bias currents - after hours of being left on, the amp doesn't even get warm, let alone hot. This implies strong class B operation, not popular among audiophiles, but which obviously can be made to work reasonably well. This ease of drive did surprise me (I mean, hey, for this kind of money it does what many audiophile designs can't). I decided to look closer into it, and with an assciate, I connected dummy loads and did some oscilloscope watching (MUCH better than TV). We fed the Yamaha with intermittent signals starting with a nominal 8 ohm impedance, working our way down. Well! I rather liked what I saw with a 2 ohm load - peak power output just before clipping was at 460 Watts! Now, that's a healthy peak output current of some 21,4 Amps, which increases if the test signal goes below 10 msec. Into 1 ohm load, it delivered all of 478W, a peak current of 30,9 Amps! Wow! And from a very, very commercial and mainstream product? While good in terms of load tolerance, do note that this is indeed speaker-thumping power; if invoked carelessly, it could easily burn out many a speaker. Good to have, but be judicious with the volume control. Overall, the Yamaha AX 592 is a rather good product, above average for its price category in several respects. It has a prodigious amount of power at its disposal and is not at all miffed by even difficult speakers - good in any case, astounding at this price point. It has an incredible amount of electronics inside, but the net effect is not what it could, and by virtue of its parts, even should have been. However, the low, low price helps one overlook some its shortcomings. The overall sound is what I would call a middle ground sound - its midrange is clean, natural, with good vocal rendition, but it has performance falloffs at both extremes. The treble is not offensive, but is not as clean is it should be in an audiophile product - it's just a little better than average for a mass produced product. The bass is clean, rhytmic and very well controlled, but it lacks a touch of warmness and weight which would make it impressive. It's real shortcoming is its preamplifier section - pull out the jumpers linking the pre with the main amp, insert a different preamp and you'll get a different tonal picture. In my case, I inserted a Thule Audio PR250B, using its standard RCA output lines, and lo and behold, the Yamaha's power amp section sounded considerably more substantial and serious in the bass and much clearer in the treble range. I repeated this test using Thule Audio's IA60 integrated amp. First I used its preamp output to drive Yamaha's power amp section, and then Yamaha's preamp outputs to drive Thule's power amp section. Sure enough, Yamaha sounded better when driven by Thule, but Thule sounded worse when driven by Yamaha's preamp. So, it's the preamp section which is below par. I gave the phono preamp a whirl, using my heavily modified Dual CS604 turntable and Ortofon LM20 (520) cartridge. It worked well enough, but I've heard better in equally commercial products (Proton, NAD, to name but two). In truth, this appears to have been an afterthought rather than a concept. If you care about your LPs, go for an outboard unit of superior quality. So, this is a product which is a pretty good all-rounder, trying to please everybody and succeeding to a very fair extent. It won't do anything nasty or naughty, but it won't really fire up the music either. It's not an audiophile product, but it's a hell of a lot of amplifier for the money. As is, without a full circuit diagram, there are two things you may want to fiddle around with, both related to the power section. While speaker pair B, the one using standard binding posts, has its posts soldered directly to the circuit board, pair A, the one with heavy duty binding posts surprisingly uses wires to get the signal up to the posts. One could try to change the wires supplied with some quality stuff, like pure silver wire - you'll need six 15 cm runs (+, - and - return for each speaker). I expect that will improve matters - how much, or how in general, I don't know. 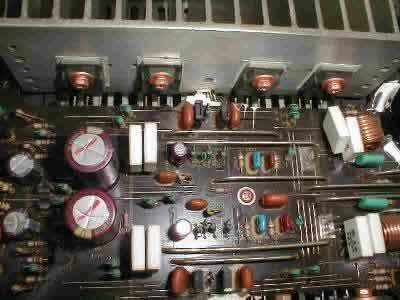 From experience gained elsewhere, I know it's a fairly safe bet to change the power transistors. You could take those supplied out and install the required number of pairs of the venerable duo, 2SC3281/2SA1302. These are 140V, 150W, 16/25A, 30 MHz devices, which would practically double the power stage capacity in most respects. From the above text, you're not likely to need the extra power, but it's my experience that these devices tend to sound more substantial then their lesser counterparts. I think there's a fair chance that the bass will improve. However, please note that without proper schematics, all this is merely guesswork - you could just as easily run into all sorts of trouble, like oscillation, for example. Also, make sure you use well matched pairs - in a class B circuit, that's of paramount importance. However, it's the preamp that's deficient here, so any REAL work should be done there - again, not possible without proper schematics. If I manage to get hold of them, I'll report on what I see.